Di has spent most of her life living and gardening in the Tropics and is familiar with most of the local fruits, plants and herbs. A Hemp advocate for many years, she raised 3 children in a shed in the rainforest, with no walls, electricity or running water for most of the time, so understands intimately the challenges of living off the land. Sam (aka Nigel) is a time traveller and writer. A Thatcher political refugee in the 80s he has since lived in PNG, SE Asia, Australia and Europe and has been loosely involved with the Findhorn Community and the Global Eco Village movement for many years. He now considers Bali home and is working with his Permaculture guru to grow stuff. 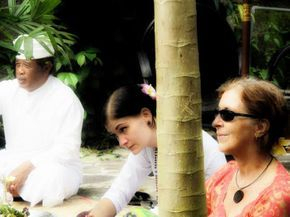 Learn from the Balinese philosophy of Tri Hita Karana, which roughly translated means "3 Steps to Harmony". In Ubud art is everywhere - in the temples, the homes and the people ! Well there is one pretty well every day somewhere in Bali. Come and learn the intricacies of the 3 Bali Calendars ! Hang out with us and you will be surrounded by Dancers, Musicians, Poets, Writers.... Balinese, Indonesian, Global - Unity in Diversity ! Cows, Birds, Snakes, Dogs, Cats and insects - all are sacred in Bali. Even the Monkeys ! Dimension 7 : the Earth. 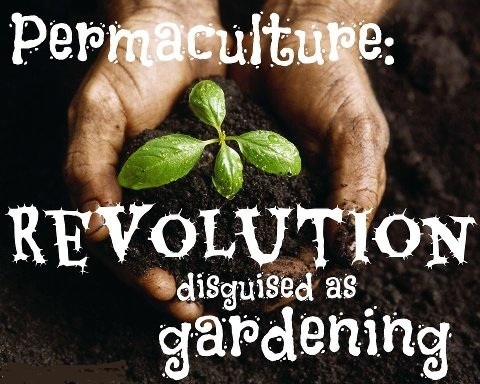 Permaculture in action.